Cut the squash in half lengthwise and scoop out the seeds. Brush with olive oil. Place on a baking sheet, cut side down and bake for 30 to 40 minutes or until tender when poked with a fork. Cool slightly on the baking sheet. 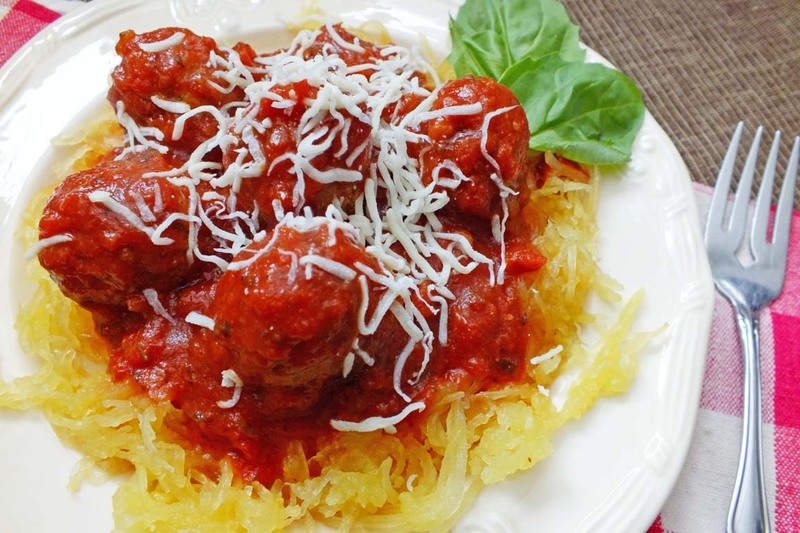 Using a fork, scrape the squash strands onto plates, top with meatballs and sauce and sprinkle with parmesan cheese and basil. Heat oven to 400°F. Mix all ingredients together in a bowl. Roll into small balls with your hands. Place the meatballs in a lightly greased 13 x 9 inch baking dish and bake about 20-25 minutes. Drain excess fat and use as desired.